Teruel has a reputation for being one of the coldest places in Spain. It’s remote and hard to get to, being the only province capital in the peninsula that lacks a train connection to Madrid. It’s remote and unspoiled by the tourist masses, which means it was right up my alley for a day trip in February 2011. It’s another place I regret I haven’t had the chance to get back to…yet. Teruel is the smallest province capitals with just 35,000 habitants. Many buildings were constructed with the Mudéjar architecture, which is a UNESCO World Heritage Site (the architecture itself.) It is located 915 metres above sea level. It is just as beautiful, at least for me, as Toledo, Ávila and Segovia, but it still remains isolated, despite the efforts of the Teruel existe (Teruel exists) tourism campaign. I took the bus from Valencia on Feb. 12, 2011 (I looked up the date on my private journal). I think it left around 8:00, and I was there by 9:30 or so. I walked around the town, visiting the cathedral, the towers, the plaza with its famous statue, and I had a tostada con tomate y JAMÓN. It was delicious. It wasn’t as cold as previously told (although remember, I am originally from Ohio so my idea of cold may not be yours. You’ve been warned). I found the train station and admired the city from down below. I decided to combine trips and take an earlier bus to see Segorbe in Castellón on the way back (which turned out to be a mistake as I missed the bus back to Valencia from Segorbe and had to stay the night!). From my personal journal…I didn’t write much. Darn. I got up early to catch the first bus to Teruel, which is this awesome little pueblo that’s a province capital. It’s really beautiful, but you can see everything there is to see in about an hour. And I even stopped for some tostada with JAMÓN, which was the best jamón ever. Teruel has four churches included in the UNESCO World Heritage Site of the Mudéjar Architectures. All of them are incredibly beautiful. You have the Torre (Tower) de El Salvador, Catedral de Teruel, Iglesia (Church) of San Pedro (which is home of the Tomb of the Amantes (Lovers) of Teruel) and the Iglesia de La Merced to choose from if you want to see Mudéjar architecture. There are a few other churches here too in other styles. The main plaza of Teruel has an interesting statue in the centre. The fountain has a small bull at the top watching the city. The fountain dates back to 1375 but has been replaced two times since. The current one was erected in 1858. Legend has it two soldiers ignored the orders of King Alfonso II followed a bull due to some dreams they had. The bull lead them here to start a new population. It is the one of the most famous landmarks of the province. Albarracín has the reputation of being one of the most beautiful villages in all of Spain (and probably attracts more tourists than the province capital.) Although it only has 1000 habitants, the village is quite beautiful and surrounded by mountains and offers a ton of hiking opportunities. It also offers a lot of history and a chance to experience authentic rural life. Even smaller than Albarracín with only 137 habitants (2004 census), the village of Mirambel is located close to the Castellón border in the Maestrazgo mountains. It’s mentioned by Basque writer Pío Baroja in La Venta de Mirambel and offers beautiful mountains and conserves some of its old walls. There are a lot of castles in Spain, and I would love to have the chance to just go touring all the castles (and then write about them, of course!) The castle located in Mora de Rubielos, population 1700 in 2009, is definitely on my list. 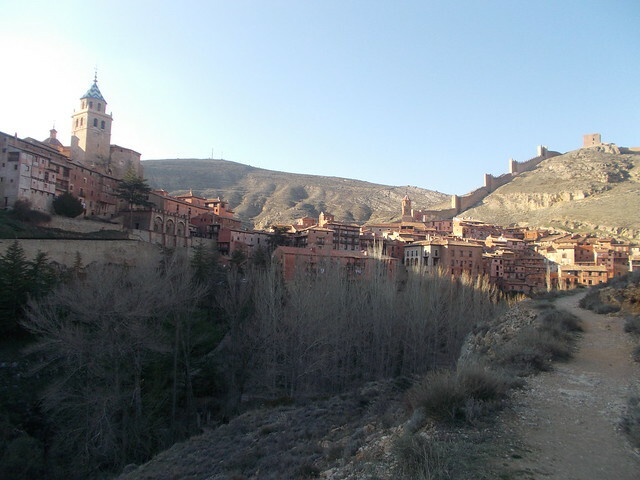 The village is located in the mountains (like most places in Teruel). Alcañiz is the second largest city in the province with 16,000 folks calling it home. The Jewish population of the city were protected until the Inquisition and had to pay a fine if they wished to move out of the city. Today you can still visit the Calatravos Castle, a gothic market, underground passages and a few churches. Nearby, you can see rock paintings of the Val del Charco del Agua Amargo. Teruel province is also home of Miravete de la Sierra, population 12, which calls itself El Pueblo Donde Nunca Pasa Nada (the village where nothing ever happens). This marketing campaign has actually brought a number of curious visitors. I am sure if I ever have a car, I’ll be one of the curious ones. ← Camino de Santiago Etapa 5. Deba-Markina.